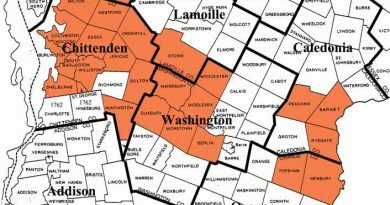 *Area, Population and Density rankings refer to Arlington’s relative position among Vermont’s 255 civic entities (9 cities, 242 towns, 4 gores and grants). Complete rankings are here. Twice in 1765, New York patented land in the same area, the first called Princetown (for King George’s firstborn, the newly-named Prince of Wales), the second merely the Napier Tract (for James Napier, the King’s inspector and director general of military hospitals in North America). The New York patents and the claims of Indians were later the source of considerable difficulty for those who settled under Benning Wentworth’s grant. Some suggest that the town is named for Arlington, Massachusetts, but that town was not so named until many years later. Rather, it is highly probable that Wentworth had a distinguished Englishman in mind, as he so often did when naming a town. The origin of the name derives from the Old English word for “the town of the people of the Earl”. With the outbreak of the Revolutionary War soon after the town was settled, Arlington’s early years were turbulent. When the more northern settlements were abandoned because of danger from the British and Indians in Canada, several of the Green Mountain Boys, Thomas Chittenden (Vermont’s first Governor), Seth Warner and the Allens’ cousin, Remember Baker, lived in Arlington, and many meetings of the Vermont Council of Safety were held there (as the Governor’s residence, it was the de facto first capital). Baker, later killed by Indians while on a scouting mission, built the first grist mill at what is now East Arlington. In a year when exceptionally late frosts caused crop failures throughout most of the town, one section was spared by its sheltered location. Its residents shared their crops and grains with their less fortunate neighbors, who took to calling the hamlet “Egypt”, in memory of the Biblical story of Joseph providing grain for his starving family and others. 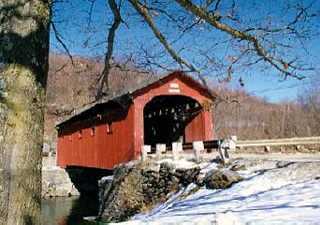 The Batten Kill, offering world-famous trout fishing, flows through Arlington on its way west to the Hudson. Lore has it that the pine tree depicted in Vermont’s State Seal stood in Arlington until the 1970s; a piece of that tree is housed in the town library. 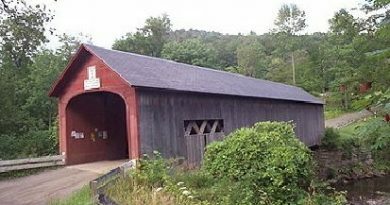 Click Here for a map of all bridges in Bennington County.